What makes an Oscar winning film? 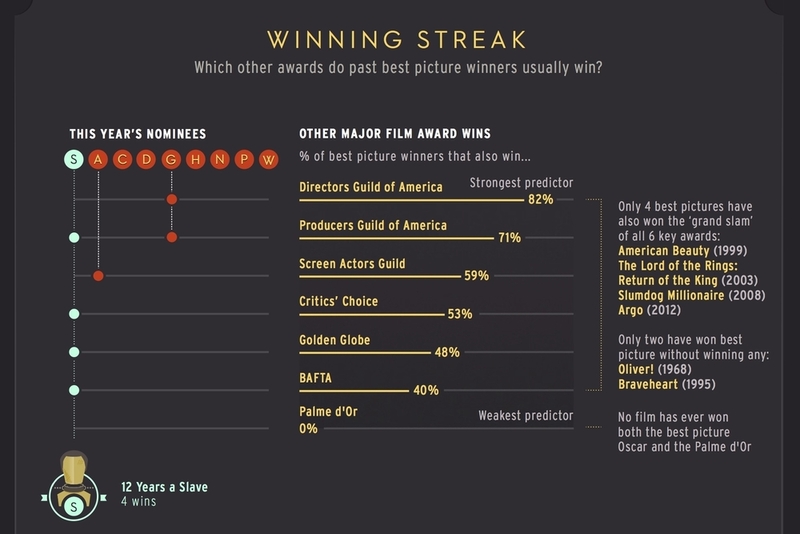 Sifting through 50 years' worth of data, we visualised the factors that mark out the Best Picture winners from the losing nominated films in this long scrolling infographic. What the data told us: winning films tended to be longer than nominated films and receive lots of other nominations in other Oscars categories – especially for writing and Best Director. And winners go on winning: success in previous film awards strongly predicts success at the Oscars. On the other hand, artiness is a turnoff: up to 2014, no Cannes winner had ever gone on to win a Best Picture award. Release date, on the other hand, has no effect on the odds of winning. And nor does perceived quality, at least according to critics. Critic scores on rottentomatoes.com are unrelated to Oscars odds, although audiences scores are, possibly because audiences vote with the benefit of hindsight and like to back a winner. Armed with these facts, we had a go at predicting the 2014 Best Picture winner – and almost got it right. This version is updated to show the actual winning film, 12 Years a Slave.